Out of 70,000-plus NCAA football players, only 1.6 percent get drafted by the NFL each spring. 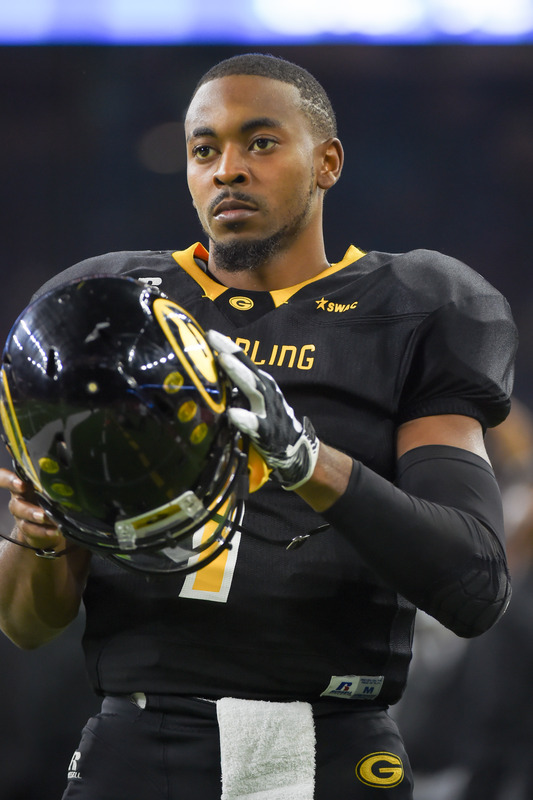 At Grambling State, 13 players believe they have what it takes to play professionally. They are DeVante Kincade, Martez Carter, Trent Scott, De’Aumante Johnson, Kendall Hill, Montrel Meander, Ja’Terious Pouncy, Bryce Williams, Johnathan Williams, Verlan Hunter, Guy Stallworth, Arkez Cooper and Samuel Reese. It is not an impossible feat to get drafted from this legendary football program. Chad Williams, the first of four historically black college and university (HBCU) players to get drafted last year, was the 98th pick in the 2017 draft by the Arizona Cardinals. The last time a GSU player had been selected before that was in 2006, when defensive end Jason Hatcher was picked by the Dallas Cowboys in Round 3. The most Grambling players selected in any NFL draft was in 1970, with nine players. Twice, in 1969 and 1976, the Tigers had eight players drafted. Scouts from 20 NFL teams — Arizona Cardinals, Atlanta Falcons, Carolina Panthers, Chicago Bears, Cleveland Browns, Detroit Lions, Green Bay Packers, Houston Texans, Indianapolis Colts, Los Angeles Chargers, Los Angeles Rams, New Orleans Saints, New York Giants, New York Jets, Oakland Raiders, Pittsburgh Steelers, San Francisco 49ers, Seattle Seahawks, Tennessee Titans and Washington Redskins — were on hand on March 22 to observe as GSU players went through measurements, bench press, vertical and broad jumps, 40-meter dash, cone drills and position drills on their campus in Louisiana. 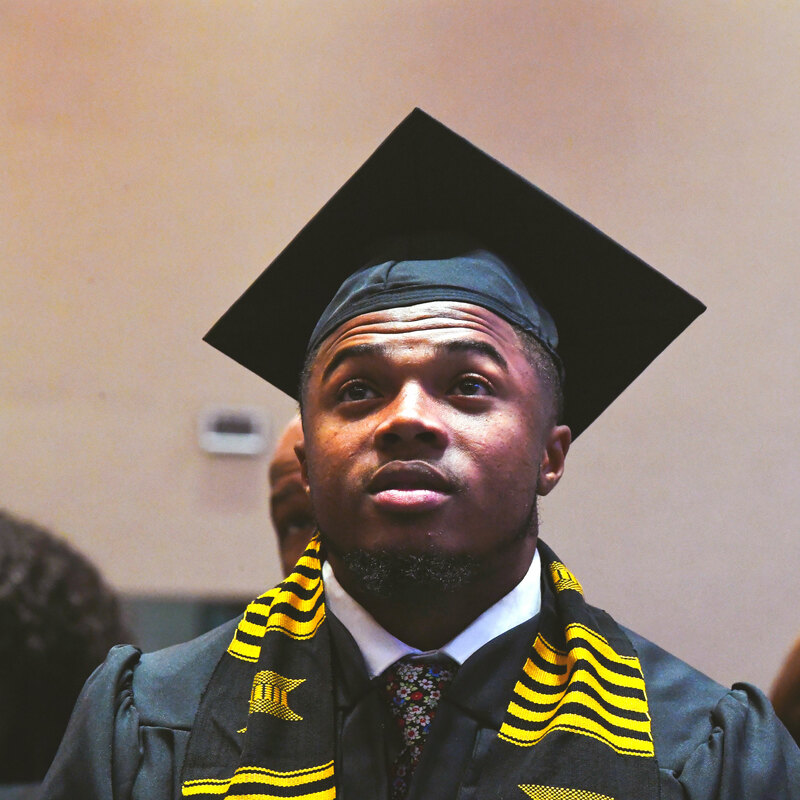 Grambling Tigers running back Martez Carter looks on during a mini-graduation ceremony for fall 2017 graduates on Dec. 15, 2017, at the AT&T Midtown Center in Atlanta. “I’m not really nervous. It’s kind of like a wedding: You know you getting married but it doesn’t really hit you until she walks down that aisle. At this point it’s unreal to me until I get that phone call or start getting those other guys get their name called,” said Carter. Carter and his agent, Malki Kawai, have been in contact with the Baltimore Ravens, 49ers, Lions, Titans and Texans, and the teams have been checking in on him by way of call and text. As he waits for the phone call, he is on a strict diet and working out daily to keep his weight under control because he felt a little heavy during pro day. “He’s done a lot of great things for this program, so you can only expect him to carry it on to the next. Very explosive kid and just polished at the running back position. If he’s drafted, you’re talking about a guy who can immediately impact on special teams in the return game and in the backfield,” said Grambling tight ends coach Darrell Kitchen. His most memorable moment was his visit to the New York Jets facility. He loves that the whole day was full of football, and he compared it to his college experience. “Here you have to go to class, you’ve got to do things like that. But when I was there, it’s all football. Film, more film, practice, weights and just taking care of your body. That’s a real job, just to be around football all day. It’s worth getting paid for. You’re working for that check,” said Carter. Nicknamed “Mr. Excitement,” the Monroe, Louisiana, native thinks he has a pretty good chance to get drafted but recognizes the uncertainty of the business and that who teams want can change in an instant. During his last season as a GSU football player, he garnered 1,560 all-purpose yards and 12 touchdowns. Carter believes NFL stands for “not for long,” and he expects to use his undergraduate degree in criminal justice. He is also working on a master’s degree in sports administration. He has aspirations of becoming a coach while also working in law enforcement. Whatever he decides, he is certain he wants to stay around sports for a little while. “Carter is a freak of nature. He’s small in stature, but he has really big body parts, long arms, big hands. Very explosive young man,” said Kendrick Nord, the quarterbacks coach at Grambling. HBCUs are not known for sending many players to the NFL, but Carter believes talent speaks for itself. “The level of talent always is a problem when you’re at an HBCU. It kind of hurts the chances of us going early in the draft. But at the end of the day, they know players have a great caliber of talent, and when you can ball, you can ball,” said Carter. Grambling State Tigers quarterback DeVante Kincade warms up before the second half during the SWAC championship game between the Tigers and the Alcorn State Braves on Dec. 2, 2017, at NRG Stadium in Houston. DeVante Kincade got to work out for the Dallas Cowboys on April 6 in their facilities. He says this was a pivotal moment because he was able to showcase his talent by running routes and throwing the ball. Kincade believes he performed at a higher level at the Cowboys’ workout than on his pro day. He said he will never forget the opportunity they gave him of feeling like a professional. “Walking in their facilities, seeing my name on the locker with a Cowboys’ jersey, it was crazy. I’m like, ‘Bro, I’m really in here right now.’ If you’re in a room full of millionaires, how can you not feel like you’re one of them?” said Kincade. Kincade has talked with the 49ers, and his agent has talked with half a dozen teams. As draft day gets closer, Kincade gets more anxious because he’s not sure what is going to happen. All he knows is that he misses football and he’s ready to start playing again. “I let my agent handle that because I don’t want to be too worried. At that time, around draft day, I just want to be surprised. I’ve got an idea, but I really don’t know for sure,” said Kincade. He has been working out three times a day beginning at 6 a.m., reading, regulating his sleep, eating healthy and playing video games with his brother and other family members. Kincade has been on his own training and researching other quarterbacks and trying to get returns. “Don’t take no time for granted. Because it might seem like you got a lot of time, but you really don’t. So just make sure you always stay prepared and work hard and give it 100 every day. … Don’t never just feel like you have time to get better another day or just skip a rep one day because you feel like you can make it up. That’s one rep that you didn’t get better; that other person across the country is getting better,” said Kincade. During his pro day, he felt as if he could have performed better. His middle finger and his main finger that he uses to throw were sprained. “It was kind of hard to squeeze the ball that day. I didn’t want to make no excuse, so I had to try to fight through it. I got better as the day went on because my adrenaline started pumping, so I really couldn’t feel it, so that’s when I started hitting most of all my throws. I hurt my finger trying to catch the ball, trying to get prepared just in case I had to be a receiver. I kind of accepted it. It was adversity as always. God is going to throw a loop at you, and you’ve just got to answer,” he said. Although he doesn’t have a team he prefers to play for, some teams that spark his interest are the Cowboys, 49ers and Seahawks. “I’ve always been a Cowboys fan because I’m from Dallas. I feel like anyone would love to play for their hometown in their home city. Another team is the Seahawks because of Pete Carroll. I love that head coach. I love his mindset and how he goes about things. Of course, the 49ers because Kaepernick was like a role model for me in my eyes. I watched him go through a lot of stuff, transitioning from a small school and going to the San Francisco 49ers and performing well,” said Kincade. 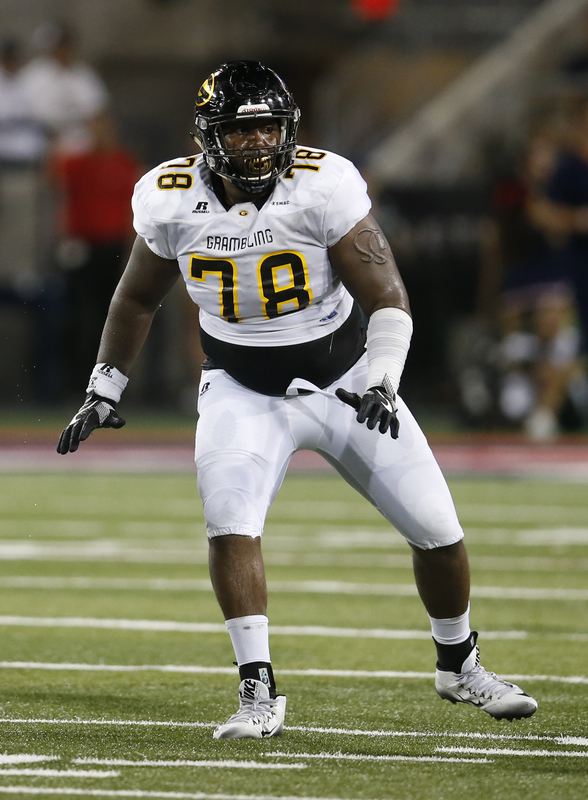 Grambling State offensive lineman Trent Scott during the first half of a football game against Arizona on Sept. 10, 2016, in Tucson, Arizona. Trent Scott stayed in the Grambling-Ruston area of Louisiana and worked with Damon Harrington, the school’s strength and conditioning coach. Scott is proud of his pro day performance. “Overall, I feel I had a pretty good day. There were a couple areas that I feel like should have been stronger. I have some stronger numbers from when I was down there, when I was training. Overall, I feel like I had a pretty solid day, from field work to runningwise,” said Scott. A couple of teams reached out to the agent for the 6-foot-5, 304-pound offensive lineman saying they liked his performance on pro day. One of the coaches told him this process is like the high school recruiting process all over again. “It’s nerve-wracking just waiting, not really knowing. What I do is stay in shape, keep working hard every day, one day at a time, and when the time comes, I will take whatever comes my way. I’ve got a pretty good feeling about how it will all unfold,” said Scott. The Huntsville, Alabama, native got his undergraduate degree in sports management and is working on his master’s degree in sports administration. He has two semesters left, one of classes and one for an internship. If football doesn’t work out, he wants a career in physical therapy and to coach on the side.